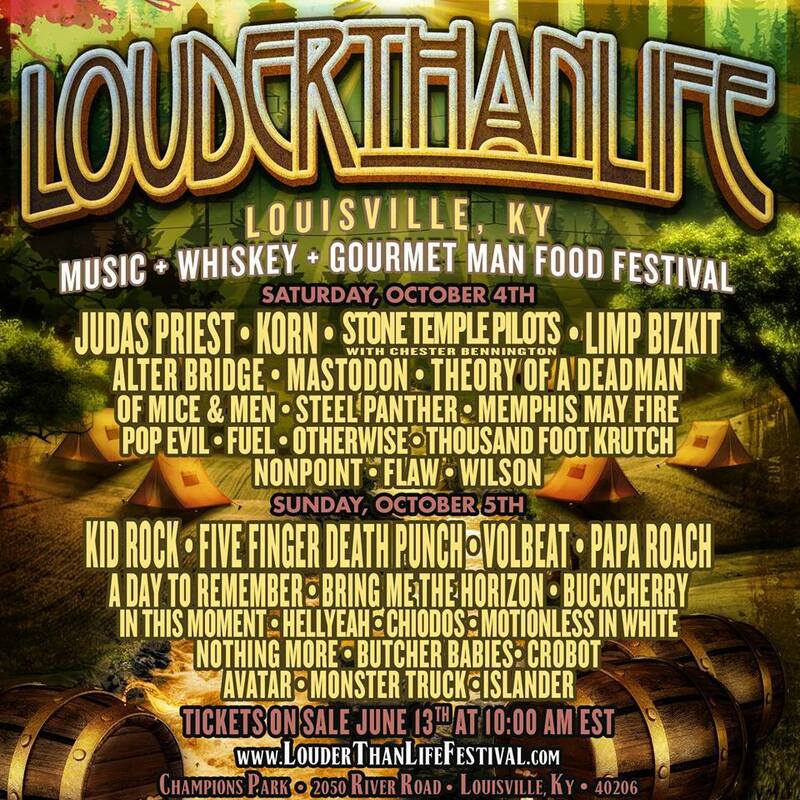 The band lineup has been announced for the debut LOUDER THAN LIFE festival, featuring music, whiskey and “gourmet man food”–coming to Louisville Champions Park Saturday, October 4 and Sunday, October 5 in Louisville, Kentucky. The powerful lineup includes Kid Rock, Judas Priest, Korn, Five Finger Death Punch, Limp Bizkit, Stone Temple Pilots with Chester Bennington, Volbeat, Papa Roach and many more. In addition to presenting top rock bands on three stages, the weekend destination festival will feature the finest local Louisville food and drink experience: bourbon exhibitions, gourmet man food, local craft beers and more. “We’re so excited to have the LOUDER THAN LIFE festival come to Louisville and I can’t wait for the world to try our great local food, which got its start with the birth of the cheeseburger in our city over 80 years ago,” says Louisville Mayor Greg Fischer. Bourbon, Whiskey & Other Spirits: Angel’s Envy, Basil Hayden’s, Benchmark, Buffalo Trace, Bulleit, Eagle Rare, Evan Williams, Jack Daniel’s, Jägermeister, Jim Beam, Knob Creek, Maker’s Mark, Red Stag, Town Branch Bourbon, Willett, Woodford Reserve and more. Beer & Wine (Local/Artist Inspired): Bluegrass Brewing Company (American Pale Ale, Altbier Amber Ale, Dark Star Porter and IPA), Alltech Lexington (Kentucky Bourbon Barrel Ale, Kentucky Ale and Kentucky IPA), West Sixth (West Sixth IPA, Deliberation Amber and Lemongrass American Wheat), New Albanian (Black & Blue Grass, Hoptimus Imperial Indian Pale Ale, Elector and Beak’s Best Bitter), Falls City Beer (English Ale, Hipster Repellant IPA and Fall Seasonal), Sterling Beer, Iron Maiden’s Trooper Beer, Mastodon’s Black Tongue, Motörhead’s Bastards Lager and more. Restaurants (Local and/or As Seen On Food Network): Down One Bourbon Bar, Highway 61 Roadhouse, Iron Barley, Lil Cheezers, Longshot Lobsta, Momma’s BBQ, Monkey Wrench, Peyton’s Bourbon Cupcakes, Rye, Side Bar at Whiskey Row, Sivori Catering (burgoo), Spinelli’s, and more to be announced. Celebrity Chef Appearances: Chris Santos, Vic Vegas, Tom Coghill, Bill Kunz and more to be announced. Hotel, camping and VIP packages will also be available for purchase during the pre-sale. VIP tickets include: a VIP entrance to venue; access to VIP lounge area featuring dedicated bar, beverage and food service; viewing of main stage (seated and standing areas); seated area with shade for dining and private restroom facilities; a VIP commemorative guest laminate, and more. NO SERVICE FEE tickets will be available at Spinelli’s Pizzeria for $99 starting Friday, June 13. All locations can be found HERE or on the LOUDER THAN LIFE ticket page. Ticket discounts will also be available for active military through LOUDER THAN LIFE partner GovX. Sponsors for LOUDER THAN LIFE include Monster Energy Drink, Jack Daniel’s, Jägermeister, F*ck Cancer, Crazy Dave’s Music, UBER, Muhammad Ali Center, Crowne Plaza, Galt House, Spinelli’s, Juvenile Diabetes Research Foundation, Original Makers Club, Louisville Metro Parks Foundation and more. 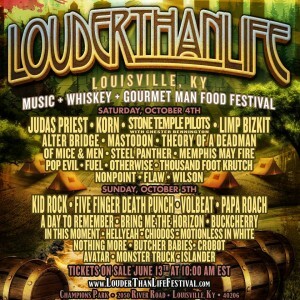 LOUDER THAN LIFE is produced by Danny Wimmer Presents, a producer of some of the biggest rock festivals in America, including Rock On The Range, Monster Energy’s Welcome To Rockville, Monster Energy’s Fort Rock Festival, Monster Energy’s Carolina Rebellion, Monster Energy’s Aftershock Festival, Epicenter—Southern California’s Rock Festival, Rockwave, The Big Ticket, Chill On The Hill, and Monster Energy’s Rock Allegiance Tour. Champions Park is located at 2050 River Road in Louisville, KY, less than three miles from downtown.